If you are interested in the project that one of the volunteers is working on at the same physical space, check out his website at sandpaperbooks.com It will be opening up soon, in early December. 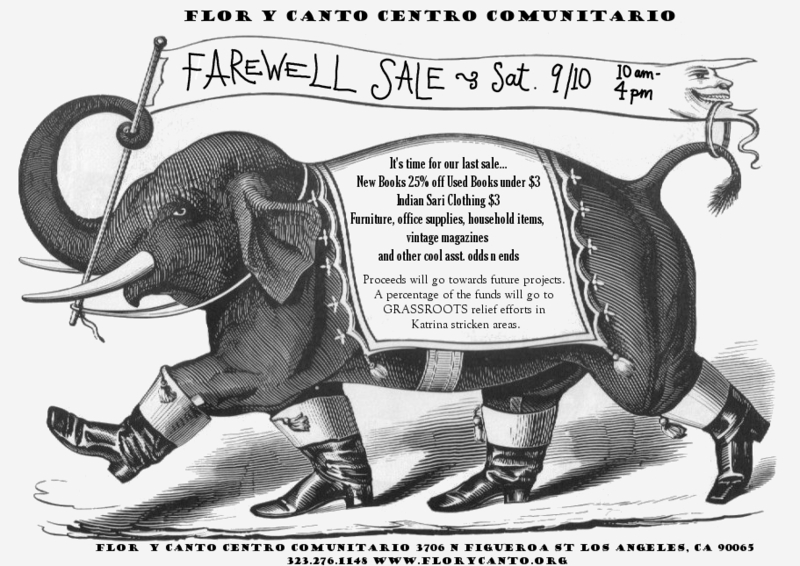 It is with heavy hearts that we must announce that at long last, Flor y Canto has come to an end. We are wrapping up the project and next week will be it's last, we will have a last clothing/book/furniture sale on Saturday Sept 10. After a final update this list will also be deleted. For a variety of reasons, we've decided to end the project. In the next few weeks more detailed information, assessments and analysis of the project will be posted on our website at www.florycanto.org One of the volunteers will be taking over the location and doing something different with it (an email with details will come later) but the project as you know it will be no more. We will also be thanking the many people and groups that have supported and contributed to the space without whose help we would not have made it this far. Flor y Canto has been serving it's purpose for the past 4 years, much longer than anyone originally expected. During that time we were able to accomplish our initial objectives of creating a local community center that would be self-sustainable and provide the space in which people could gather for a wide variety of purposes. We've been able to host thougthful discussions, engaging films, entertaining readings, and such a wide range of events that it's kinda hard to explain. And all of it was done by volunteers, people that choose to contribute some time and effort to see it happen. It's incredibly sad for us to come to this conclusion but we make it in good spirits, knowing that we've accomplished our goals and going out on top, in our own way. All good things come to an end. This is ours. Muchisimas Gracias por Todo! Your friends at Flor y Canto. New Books 25% off Used Books all under $3, Indian Sari Clothing $3 (bags and bags of new pieces since the last sale), Furniture, computers, desks, office supplies, household items, boxes of vintage magazines, records and other cool assorted odds n ends. We'll also be serving homemade waffles and fresh juice in the morning! Funds will go towards future projects and closing costs. A percentage of the money raised will go to GRASSROOTS relief efforts in Hurricane Katrina stricken areas. Thanks to the Los Angeles community for your support. We look forward to seeing you Saturday! Come One, Come All! Farewell Party! Music, Food, and Celebration!